The latest work of the NeuroCyto Team (previously on bioRxiv) is now published in the Journal of Cell Biology. We collaborated with the Roy lab to reveal a new mechanism of slow axonal transport, based on the previous discovery of actin hotspots and trails. Hotspots are static actin clusters that appear and disappear within minutes every 3-4 µm along the axon. They generate the assembly of trails, long actin filaments that polymerize along the axon and collapse within seconds. Our new article first shows that trails polymerize at their barbed ends, located at the surface of hotspots. Each trail is thus pushed away from the hotspot as as it grows, resulting in a net displacement of actin monomers after trail collapse. In addition, trails grow in both directions (anterograde and retrograde), but with a small bias toward the tip of the axon (58% anterograde vs 42% retrograde). The combination of these two processes (displacement of actin by trails and anterograde bias) results in the slow progress of actin along the axon. Modeling from the Jung lab allowed to determine the overall actin transport speed resulting from the hotspots and trails dynamics. Strikingly, this slow anterograde transport speed of actin (0.4 mm/day) precisely matches the values obtained by classic radio-labeling studies. This is a fundamentally new mechanism of slow axonal transport for cytoskeletal components, based on a biased assembly/disassembly mechanism rather than processive transport by motor proteins. 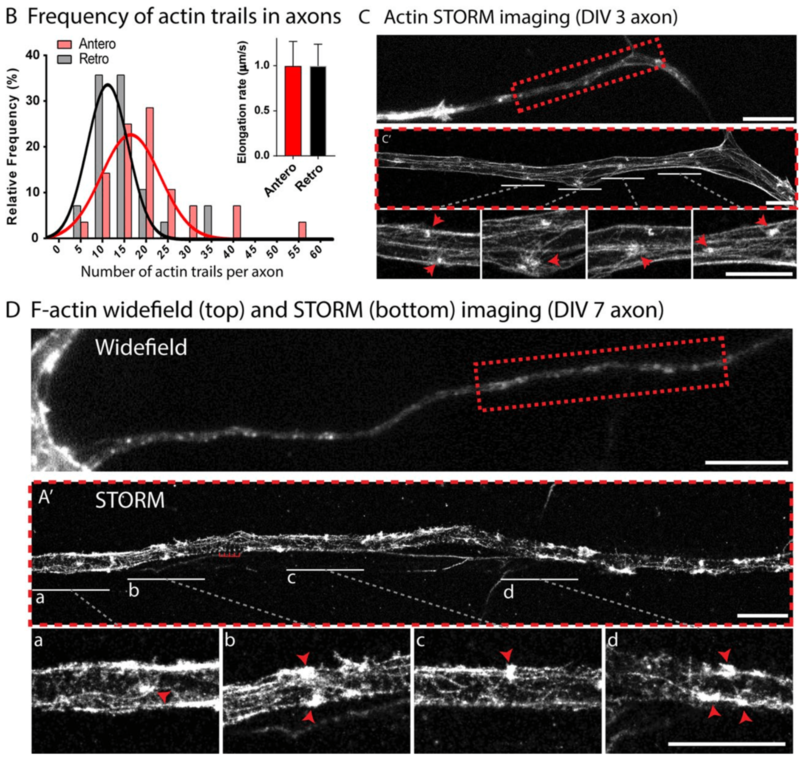 In this work, we used STORM imaging of axonal actin to pinpoint the architecture of hotspots, showing that the multi-directional growth of trails make them appear as asters when the axon is thicker (see Figure). Furthermore, we imaged hundreds of hotspots by STORM and quantified their diameter to ~200 nm. This is a first step toward elucidating the molecular organization of hotspots and trails, which will be crucial to understand their cellular functions.